No matter how many times the Fox News of Child Welfare says it does, it’s still not true. I have previously noted the serious potential for harm caused by the slanted “journalism” practiced by the so-called Chronicle of Social Change – the Fox News of child welfare. Things like promoting a column using a vile racial stereotype to attack an impoverished birth mother, or the Chronicle’s cozying up to the group home industry. But there’s something else worth noting: A bizarre, if relatively harmless, obsession on the part of its publisher - and self-proclaimed "child welfare expert" -- Daniel Heimpel: His demonstrably erroneous claim, repeated over and over, that Los Angeles County has the largest child welfare system in America. Even using Heimpel’s measure of choice, it does not. I have no idea why it matters so much to him. Sure, he lives in Los Angeles, but it’s not as if having a super-sized child welfare system is anything to be proud of. Yet Heimpel’s fervor about this runs so deep that less than a month after Chronicle’s editor John Kelly corrected the error, Heimpel repeated it, and seemed to double down on it. It’s been repeated in story after story ever since. It’s reached the point where people in Los Angeles County child welfare are starting to believe it. Does it really matter? Not nearly as much as the Chronicle’s other failings. But if they can’t – or won’t – get something so basic correct, why should they be trusted on larger policy issues? The Los Angeles County child welfare system is very, very big. That makes sense given that Los Angeles County is very, very big. It’s likely that Los Angeles has the largest child welfare system run by a county or other unit of local government. But in most of America, states, not individual counties, run child welfare. And it’s easy to forget that there are states that have many more children than Los Angeles County – so many more that it’s unlikely on its face that Los Angeles County would have a larger child welfare system. Another approach is to use only measures that detail how often the child welfare agency actually intervenes in a family’s life. TABLE #2: Definitions and sources are listed at the end of this post. ● Number of children who were subjected to child abuse investigations? Los Angeles is third, behind Texas and Florida. ● Number of children in foster care? Los Angeles is third again, behind Texas and Florida. Los Angeles’ child welfare agency is the largest in the nation, serving more than 34,000 children, almost 21,000 of whom are placed in out-of-home foster care. In other words, he simply combines the number of children in foster care and the number receiving “services” in their own homes. There’s just one problem: Florida and Texas also provide in-home “services.” And yes, they report doing it for a larger number of children than Los Angeles. So in category after category after category – including Heimpel’s category of choice -- Los Angeles County, California is not the largest child welfare system in America. Complicating things further: There is plenty of room for fudging some of these figures. For example, Texas coerces large numbers of children into kinship foster care placements without taking the family to court - and doesn’t count them in its statistics on the number of children in foster care. And, of course, these figures say nothing about the rate at which these jurisdictions place children in foster care. One reason the Los Angeles system is so large is the simple fact that it takes away too many children. Kelly corrected the text of the story and, after I sent a second email, he corrected the headline. But while the Chronicle has never again called the L.A. system the largest in the world, in story after story the Fox News of Child Welfare has insisted it’s the largest in the United States. The story citing the combined in-home and foster care numbers – published only a month after the Chronicle corrected the earlier story - seemed to be Heimpel’s way of doubling down. That only made him doubly wrong. 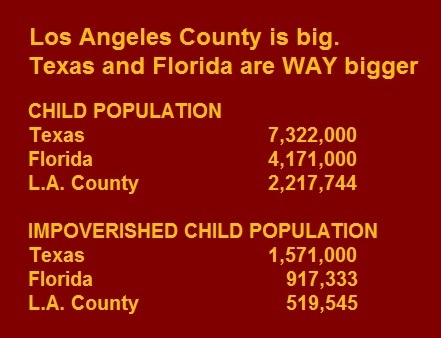 It may not be true that everything’s bigger in Texas, but the child welfare system is. CPS investigations are for the most recent 12 month period for which data are available; the other categories are snapshots of the number of children receiving services on the indicated date. Definition of in-home services: Texas: Children receiving Family Preservation Services, August 31, 2017; Florida: Children receiving in-home services and family support services, April 30, 2018; Los Angeles: Defined as “In-home Services” mostly “Family Maintenance Services,” August 31, 2017 Dates are the same for number of children in foster care.